Our aim is to give our guests the best possible experience with the least possible impact on the local community and environment. We are committed to sustainable tourism and a sustainable lifestyle. Stewart Island presents us with an ever-changing cycle as the seasons progress. It always annoys us that we can only share the current season with our guests and so they miss out on the special things that happen over the rest of the year. So we have decided to have an occasional diary of the things we notice around the village and on Ulva Island. Just living in this world has an impact on the environment around us. We guess the trick is to keep our impact as small as possible. That’s not necessarily easy on Stewart Island as the Island is to such a large extent dependant on non renewable energy sources. The Island runs almost literally on diesel fuel, firstly for transport to and from the mainland, secondly all our electric power is diesel generated as there are no suitable rivers for hydro power and thirdly we use diesel for all our domestic hot water and central heating as it is the most cost efficient method available to us. Sails Ashore was designed to make full use of passive solar energy. 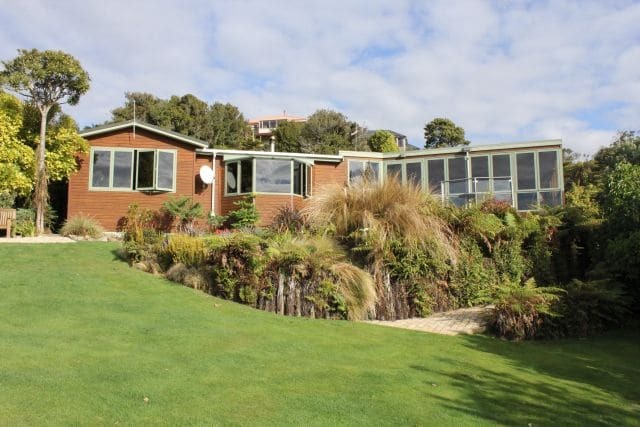 The sun room faces north and with full double glazed windows towards the sun and full wall, ceiling and underfloor insulation through out ensures we keep heating costs to a minimum. . Stewart Island is a bit marginal for solar water heating, but newer technology is very interesting and may now make it viable. Quite apart from the conservation aspect of fuel minimisation the rapidly increasing costs of liquid fuel certainly focuses our thinking on efficient use of energy. We sort all domestic waste and recycle wherever possible. 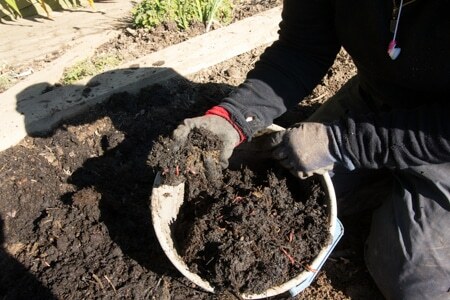 A large compost bin and worm farm deals with garden and food waste and also contributes to our organic garden and glass house fertility. In addition we collect lawn clippings from the local community lawn mower, this in total turns into around 6 cubic metres annually. 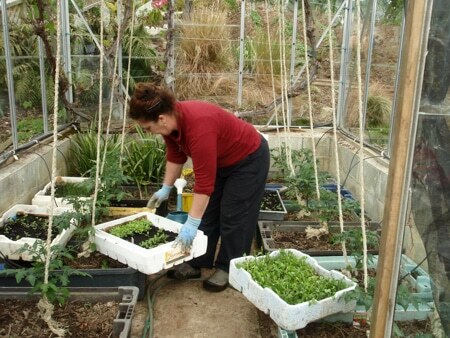 We grow as much of our vegetable requirements as possible. We are now changing to LCD light bulbs , replacing even our older fluorescent bulbs, as although the energy savings are minimal, the vastly superior life expectancy makes this a “no brainer” . We have timers and dimmers on appropriate circuits. All our domestic water is collected from our roof, stored in large tanks, UV treated and micro filtered before use, exactly as “Stewart Island Rain” bottled drinking water is prepared. And Stewart Island Rain won NZ’s boutique bottled drinking water competition so it’s pretty good water to drink. Iris and her worm farm. Apart from onions and citrus which can kill the worms, all our kitchen scraps end up here. We make around 6 cu metres each year. Tomatoes and grapes would just be a dream without a glasshouse. Like many places in New Zealand, Stewart Island has it’s share of introduced mammalian pests. In particular rats, opossums and feral cats are to be found around the village, as well as the wider Island environment. A local trust has taken on the task of trapping and poisoning these pests within the village and in particular the Ackers Point area. The result has been quite impressive with so far this year almost a 1000 rats being trapped. Stewart Island Robins have been reintroduced to Ackers Point and the ultimate aim is to release Saddlebacks. Neither species can survive with rats. We have noticed and with our guests enjoy increased bird life in our garden. The work of the trust can only improve this for the enjoyment of all. As well as bird life we are noticing a significant increase in small plants such as orchids within the trapped area. Many of which are difficult to find further back in the forest. We service one line of some 30 odd traps based around Observation Rock and down as far as the Post Office. Quite apart from the bird life rats are a problem for any householder and as well can do significant damage in a vegetable garden. This winter we have not noticed any rat sign for the first time ever around Sails Ashore or Kowhai Lane and “our” trap has caught only two. The trust is funded entirely by donations and although there is a paid staff member, much of the work is done by volunteers. We have post cards by Gilbert van Reenen on sale and all profits from this go to the trust and in addition many guests ask to make a cash donation. Thus helping enable the work continue. 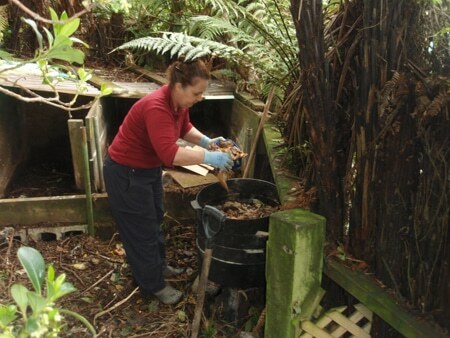 The trust has commissioned a study to investigate the possibility of eradicating rats, feral cats and opossums from all of Stewart Island. It makes very interesting and thought provoking reading and with the success of Ulva Island showing the way is perhaps the future for Stewart Island.